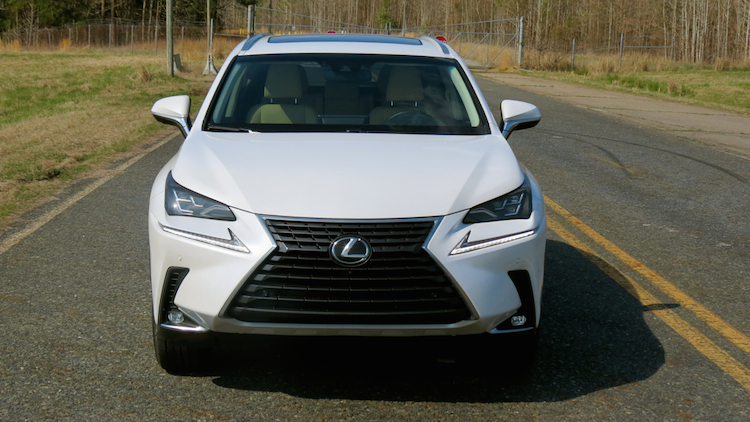 The Lexus NX 300 offers contemporary styling, a luxurious interior, and advanced technologies. A hybrid variant is also available. In a world of utility vehicles, Lexus is well represented. From the small UX to the compact NX, and from the popular RX to the big GX and LX models, Lexus has something for everyone. You’ll even find hybrid options with the first three choices, each of which delivers outstanding efficiency and cleaner emissions. The 2019 Lexus NX returns without major changes this year. This model was launched as the NX 200t in 2015 and is officially known as the NX 300. The NX 300h is the hybrid variant and is marketed separately. Our review covers the gas-powered model only. 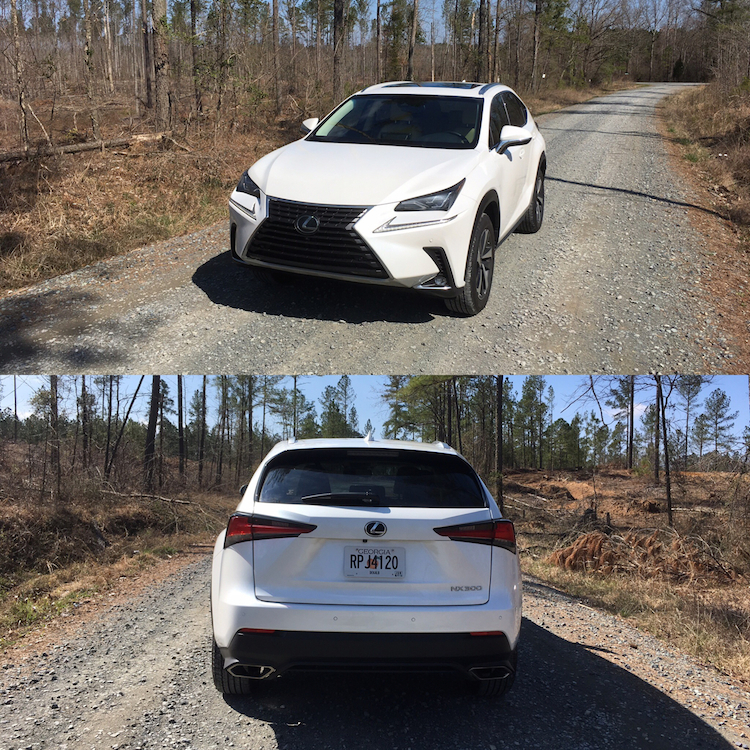 Lexus offers the 2019 NX in two trims: 300 ($36,485) and 300 F Sport ($38,725). Add $1,025 for the delivery, processing & handling fee. Front-wheel drive is standard. 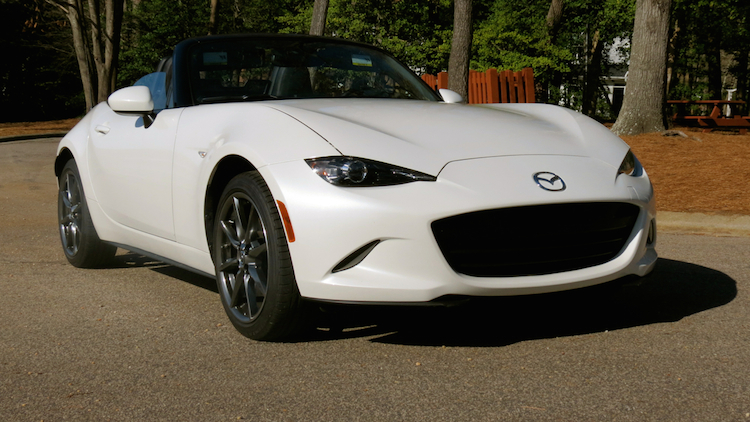 Opt for all-wheel drive and your price increases by $1,400. You’ll find four package options with the base model. These include a Navigation Package ($1,860), which bundles a navigation system with a 10.3-inch display screen, a 10-speaker audio system, and an additional USB port, and a Comfort Package ($980) with heated and ventilated front seats, blind spot monitoring with rear cross-traffic alert, and automatic dimming side mirrors with automatic tilt-down in reverse. The two other packages include a Premium Package ($3,270). This one bundles enhanced LED daytime running lights, a power moonroof, 18-inch alloy wheels, power side mirrors, heated and ventilated front seats, a power tilt-and-telescopic stewing wheel, and blind spot monitoring with rear cross-traffic alert. Building on this package is the Luxury Package ($4,705), which adds linear black shadow wood interior trim, perforated leather-trimmed interior, and rain-sensing wipers. You’ll find individual options offered as well, including an outer-sliding moonroof ($1,100), power rear doors with kick sensor ($550), upgraded wheels ($420), heated front seats ($440), power-folding and reclining rear seats ($400), and other comfort and safety options. As for the F Sport models, these feature enhanced styling and an adaptive variable suspension system. 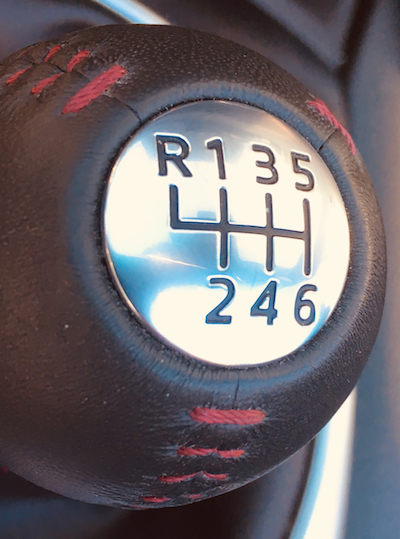 You’ll also find gauge upgrades, improved seat bolstering, and other special touches. A few of the package offerings found in the base model are available here. Each has its own take based on the trim. The NX’s dimensions are small and parallel the size of the Toyota RAV4 on which it is based. But apart from platform sharing, these two models are dramatically different. Up front, the expected Lexus hourglass grille dominates and is offset by signature L-shaped accent lights. Wraparound headlamps and fog lamps add flair. 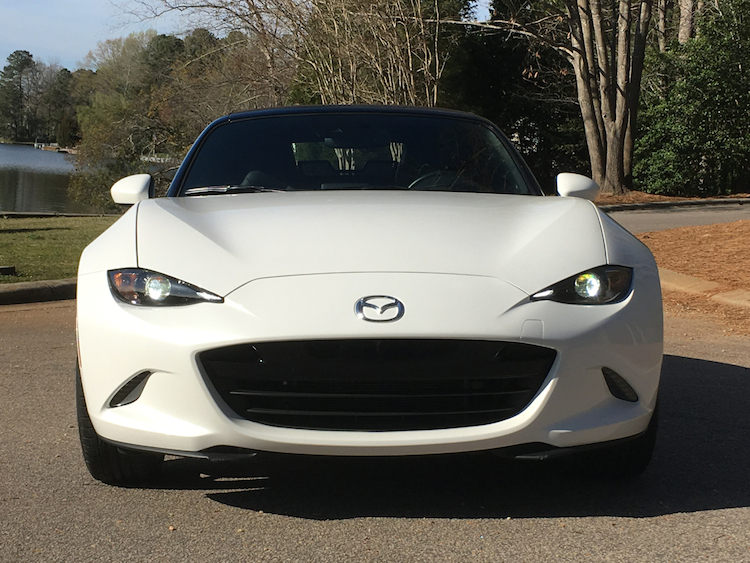 The hood’s crease lines meet up with the edges of the grille for a dramatic touch. The NX’s profile may be its most controversial feature. It has a falling roofline, a high beltline, dramatic body sculpting just above the rocker panels, and big arched wheel wells. 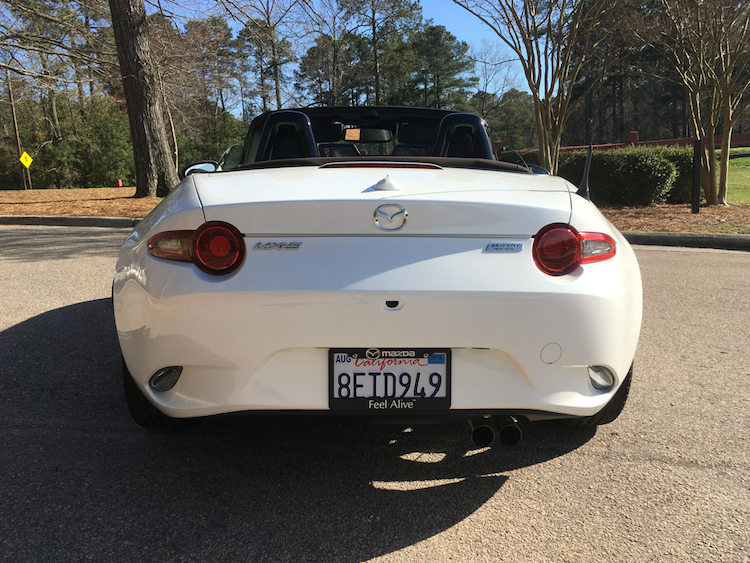 From the rear, the look is only slightly less dramatic with this model’s clamshell liftgate topped by a spoiler and accented by wing-like wraparound tail lamps. With the NX, Lexus successfully found a way to blend luxury with sportiness. Inside, the cabin is cozy, not especially roomy and is definitely ideal for four, not five. 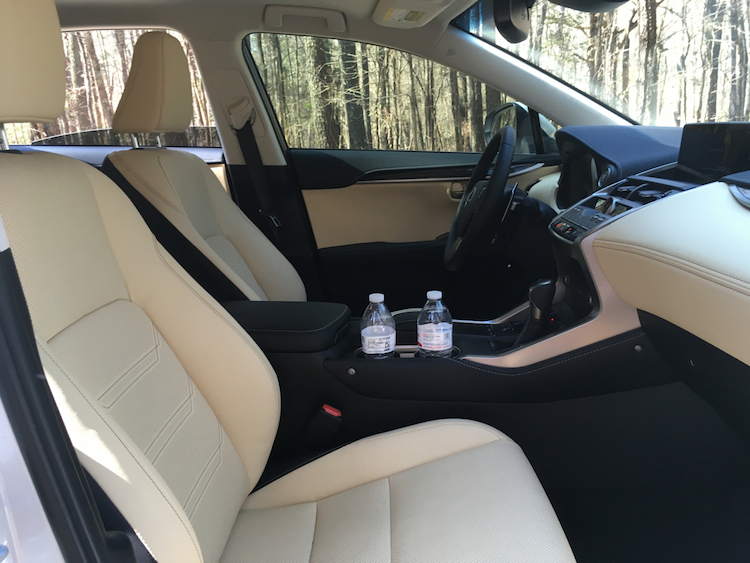 In any case, the NX features choice materials along with excellent fit and finish — leather, aluminum, and available wood trim combine to give the interior a look that is at once elegant as it is sophisticated. 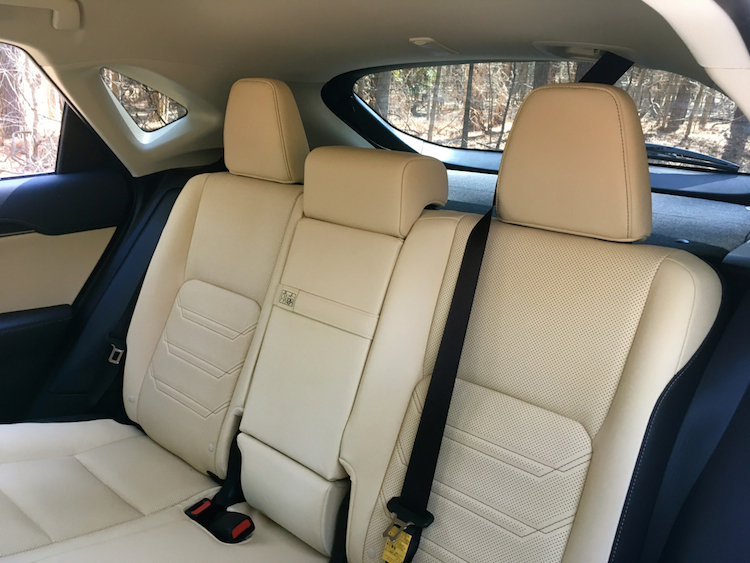 Further, Lexus dresses the seats in NuLuxe, which is imitation leather and as close to the real thing you’ll find in terms of comfort and breathability. 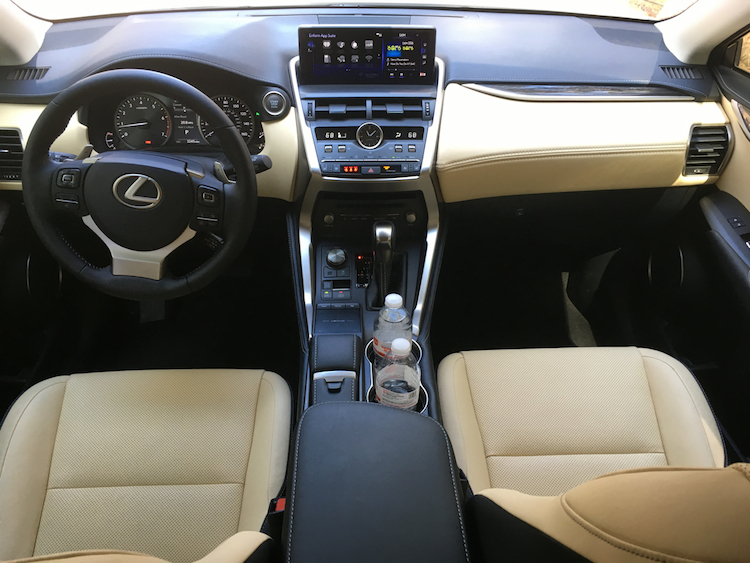 Lexus divides the upper and lower sections of the dashboard by color, supplying a two-tone effect that meets at the center stack. The color display sits on top of the dashboard and the entire stack is trimmed in aluminum. Just enough buttons, knobs, and switches are at the ready — not too many to feel cluttered, but enough to cause the driver to examine further. The Remote Touch controller requires a moderate learning curve and was frustrating at times. On the other hand, the interface in the all-new 2019 ES is much simpler and will likely find its way to a future NX. The front seats are very comfortable and adequately bolstered. Access to the rear compartment requires lowering your head to avoid bumping it. 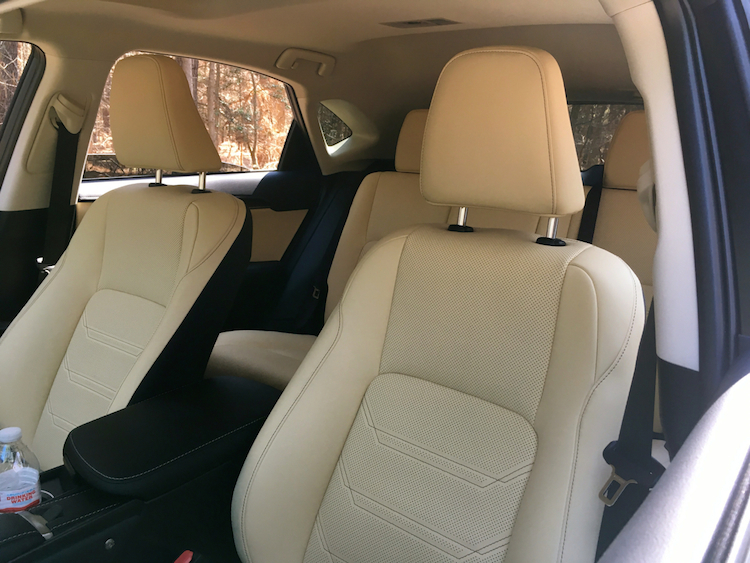 Once inside, that space holds two adults reasonably well, but if you’re tall, then legroom becomes an issue, especially if either front seat is pushed back. 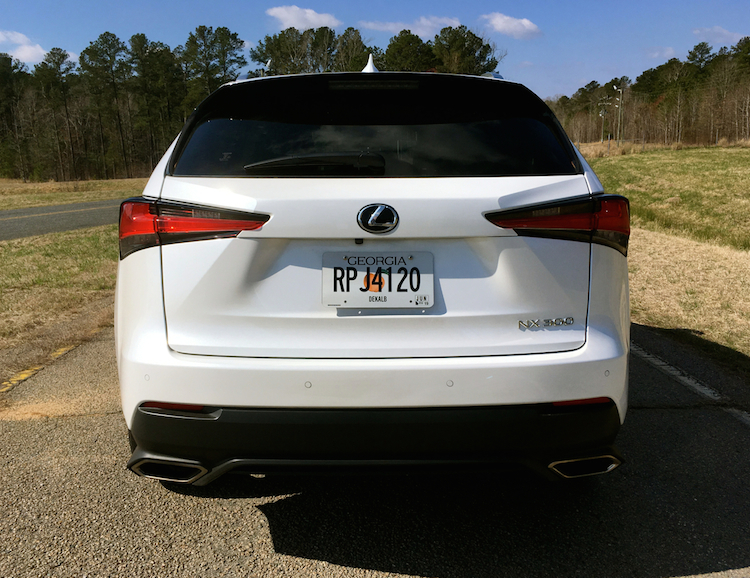 In this case, the Lexus RX is the better choice for four adults. It also has a third-row option, which is ideal for carrying children. Storage space is small, measuring just 17.7 cubic feet behind the second-row seat and 54.6 cubic feet with the rear seat folded. The competing Acura RDX offers 31.1/79.8 cubic feet of storage space, while the Cadillac XT4 splits the advantage with 22.5/48.9 cubic feet of space. There is some very good news on the tech front this year, at least for models built after Oct. 1, 2018. Both Apple CarPlay and Amazon Alexa functionality are included. As for Google Android Auto? Not yet. We expect Toyota/Lexus to add this feature sometime in 2020. But we can’t say it’ll be included retroactively for existing models. Managing most interior functions requires using the Remote Touch controller found between the seats near the stick shift lever. It is a one-finger-touch controller that acts very much like a mouse — you simply need to hover over the correct command to activate same. On paper, this isn’t all that difficult. In reality, it can sometimes prove frustrating, even distracting. You should familiarize yourself with its workings before you hit the road. The standard 8-speaker audio system delivers excellent sound and works with the 8-inch screen. All models come with Bluetooth and USB smartphone connectivity. HD Radio and Siri Eyes Free are also included. A navigation system is available and comes bundled with other multimedia improvements, including a 10.3-inch color split-screen display and a 10-speaker audio system. As for safety features, Lexus goes beyond the universally standard rear-view monitor to include a suite of driver-assist items. Beginning with automatic high beams, Lexus bundles a pre-collision system with pedestrian detection, lane departure alert with steering assist, and dynamic radar cruise control with full stop. Also available is blind spot monitoring with rear cross-traffic alert. 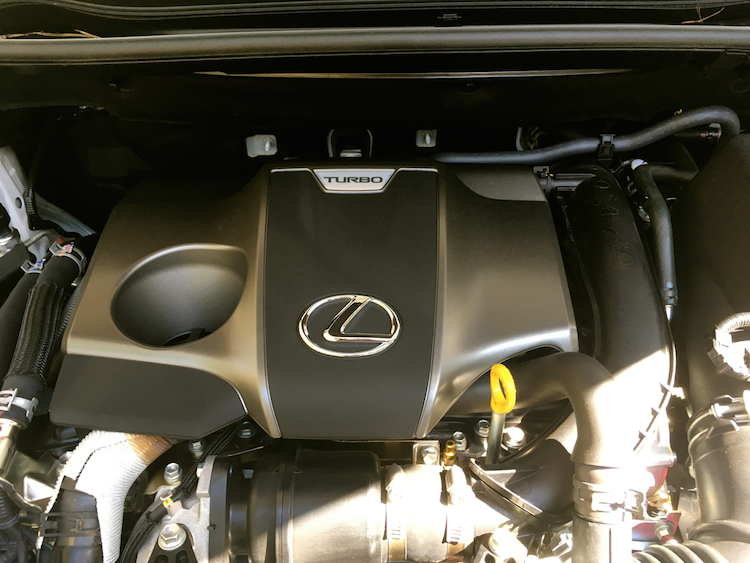 Under the hood of every NX model (except for the hybrid) is a turbocharged 2.0-liter four-cylinder gas engine. This engine produces 235 horsepower and 258 pound-feet of torque. In a world where 8-speed automatic transmissions are commonplace, the NX relies on six forward gears. We expect that’ll change when a new model arrives next year. The NX isn’t especially fast off the line and turbo lag is noticeable, but that’s not much of a deterrent. We found the NX performs best on the highway as it throws down ample passing power as needed. The steering is evenly weighted and agile. You’ll be able to swing into an empty parking lot with ease and exit the same. On the highway, it adds weight for a more composed feel. On twisty roads, the NX throws in some body roll, but not enough to make a difference. Choose the F Sport version with its adaptive suspension system if you desire improved handling, especially when pulling out of corners. Play with the drive mode select (eco, normal, sport) and gear changes and throttle mapping change. Reserved exclusively for the F Sport are Sport S and Sport S+ modes, but only when equipped with the adaptive suspension system. As for fuel efficiency, this model is rated 22 mpg in the city and 28 mpg on the highway for a combined EPA-estimated 24 mpg. Keep in mind that the NX takes premium grade gasoline only. The Lexus NX is showing its age as it nears the end of its first generation. Nearly every competing model is newer and that means consumers have much to consider when evaluating their options. 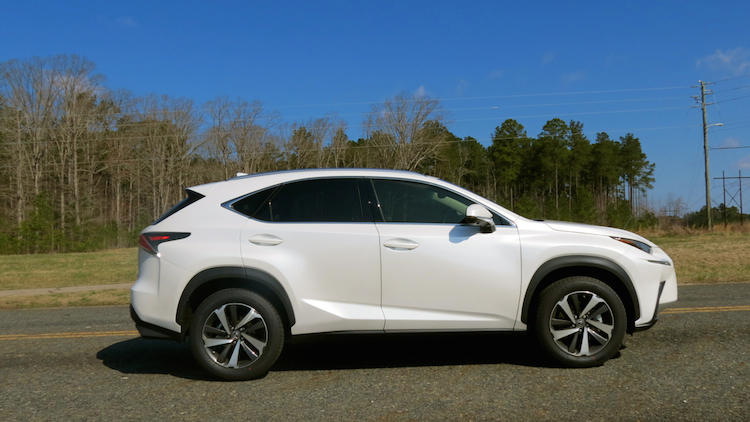 Although not the focus of this review, the hybrid variant offers a compelling reason to consider the NX. It costs $2,400 more than the standard model, but it comes with all-wheel drive. This means it only costs $950 more than the comparable all-wheel-drive gas-powered NX, while delivering a 7 mpg edge. As fuel prices continue to rise, you’ll recover the extra cost of the hybrid quickly. Lexus NX photos copyright Auto Trends Magazine. All rights reserved.